It’s already 2019, and while we don’t have flying cars or robots walking the streets (yet), it’s quite clear that the future is now. The Internet of Things and Artificial Intelligence have changed the way we all view and interact with the world around us. IoT and AI have dominated recent technology headlines and will continue to do so for the foreseeable future, but there is also another major technology trend in the works for 2019 that will directly affect IT decision makers moving forward: the move away from enterprise networks (running through centralized MPLS backbones) towards edge networking – particularly distributed SD WAN technology. To help you get a grasp on this important topic, we’ll share some of the main factors behind the transition as well as how you as an IT leader can position your company for future success. In a standard MPLS-based deployment, bringing a new branch online involves a great deal of effort on the front end such as commissioning new MPLS circuits, buying expensive proprietary hardware and configuring everything manually. 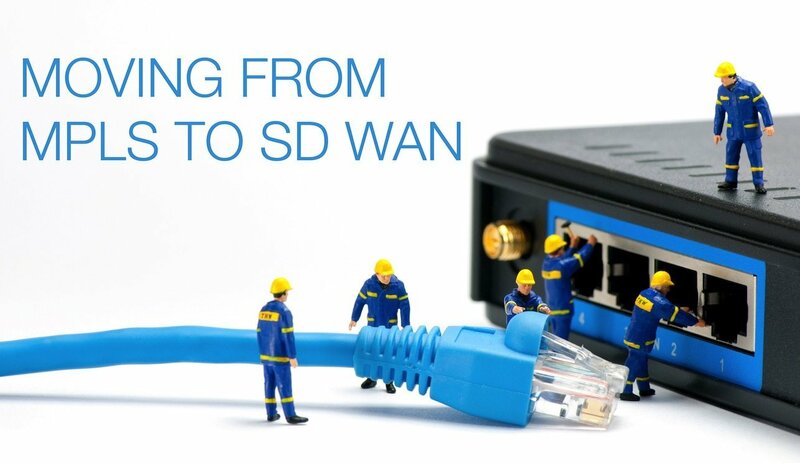 SD WAN offers a tempting alternative to the above. Automated network control saves time and boosts performance by selecting the best networking options from the available circuits. And with no MPLS-vendor lock-in, data cost savings can be substantial, too. SD WAN has been an up-and-coming technology for many years now, but only recently have big players such as Cisco and VMware become heavily involved in the marketplace, buying up the leading SD WAN players one by one. But that’s not exactly a bad thing. With their enormous marketing budgets, tech megaliths like Cisco and VMware will be playing a big part in the upswing of SD WAN adoption while also helping to keep costs competitive. This does pose one significant challenge for businesses looking to enter the cloud, though. With so much flux in the market, how do you choose a stable cloud vendor who you know you’ll be able to trust over the long-term? The answer isn’t always easy. Fortunately, dilemmas like this are something we at Shamrock see every day, and we can help you navigate through all the drivel and get down to what’s really important for your business. SD WAN technology is maturing at just the right time, with more enterprises recognizing that the key to their futures reside within the cloud. However, businesses still need to exercise caution when selecting which SD WAN provider to use and determining how exactly this technology will be used within their network architecture. Bringing in a a vendor-neutral consultancy like Shamrock can mitigate many of these concerns. Want to know how your company can successfully switch from centralized MPLS to distributed SD WAN? Shamrock can help. Our consultations are free and our experts can give you the important pros and cons to consider before making the move. One of the most vital decisions enterprises will need to make is whether to manage your own SD WAN networks or to invest in a fully managed ‘SD WAN as a service’ option. The growth in managed services is another reason why SD WAN has taken off, but that doesn’t mean it’s the right choice for your company. Make sure you look carefully at all the various options available to you and should you decide on a managed service, also make sure that you have an adequate SLA in place. The dangers of cybersecurity breaches have made many businesses hesitant in moving away from their expensive – but secure – private networks and into the risky waters of the internet. SD WAN vendors have sought to reassure businesses by incorporating more and more security features into their bundles. Security is also a prime focus for Shamrock, so whether you plan to manage your own SD-WAN devices or opt for a fully managed SD-WAN service, we will ensure that you have the most secure set up for your needs. That includes properly vetted devices and enterprise-grade end-to-end encryption. We’ve led hundreds of successful audits, RFPs and design processes for some of the largest SD WAN deployments on the market. So take advantage of our free consultation and see for yourself why CIOs at Fortune 500 and Fortune 100 companies trust us with their SD WAN deployments. As with every hot trend, there is always a looming danger of early adopters jumping in too fast and too deep before realizing they’ve made a critical mistake. We see it all the time but luckily, it’s avoidable. We’ll help you every step of the way, from choosing the right SD WAN vendor, to deciding between self-hosted or managed deployments, and even rubber-stamping your security setup.